BBC Worldwide and Starz have announced Torchwood: Web of Lies, a series of 10 three-minute “motion comic narratives” coming to iOS. The interactive comic is based on the Doctor Who spinoff series coming to Starz in July. [ad#Google Adsense 300×250 in story]Torchwood is a covert government operation tasked with quelling paranormal and extraterrestrial incursions. Featuring John Barrowman as Captain Jack Harkness and Eve Myles as Gwen Cooper, the series ran for three seasons on BBC and is coming to America on the Starz cable network. 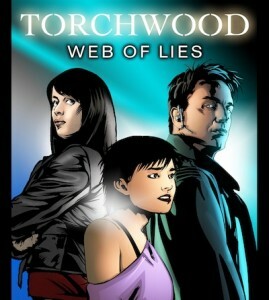 “Torchwood: Web of Lies” is designed to accompany the new season, “Torchwood: Miracle Day,” and will initially be available prior to the launch of the series on Starz, with new narratives and games available for download following each show’s broadcast. The games feature the voice talents of John Barrowman and Eve Myles, as well as Eliza Dushku, known for her appearances on Buffy the Vampire Slayer, Tru Calling and Dollhouse. The first narrative and game will be released for free, with the remaining nine available as in-app purchases in packs of three for 99 cents each or as a bundle for all ten for $2.99.